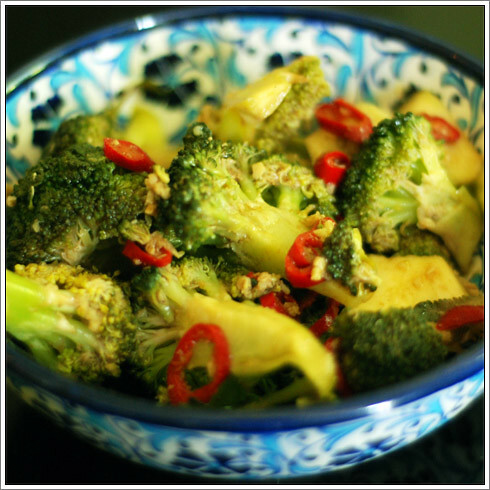 I rarely get to cook with broccoli as R is none too keen on the stuff - a shame as it's one of my favourite vegetables. However, a very good friend of mine (she of garlic soup fame) made this for me last week, and I loved it so much that I asked her for the recipe and then in turn made it for another friend at the weekend. It is incredibly simple to make, and nearly no cooking is involved as the broccoli is "cured" as opposed to being cooked in any way. And it is one of those dishes which tastes even better on the second day! Chop the broccoli into individual florets, then toss with the salt and vinegar and set aside. Deseed and slice the chilli, then, in a frying pan, heat the olive oil until hot but not smoking and add the chilli and cumin. Fry for 30 seconds then crush in the garlic and cook for a further minute. Stir in the sesame oil then pour over the broccoli and toss thoroughly. Let marinade for an hour at room temperature, then transfer to the fridge. If you can wait long enough, leave it overnight as it tastes so much better the next day! Taste for seasoning before you serve as it may need a little more salt.